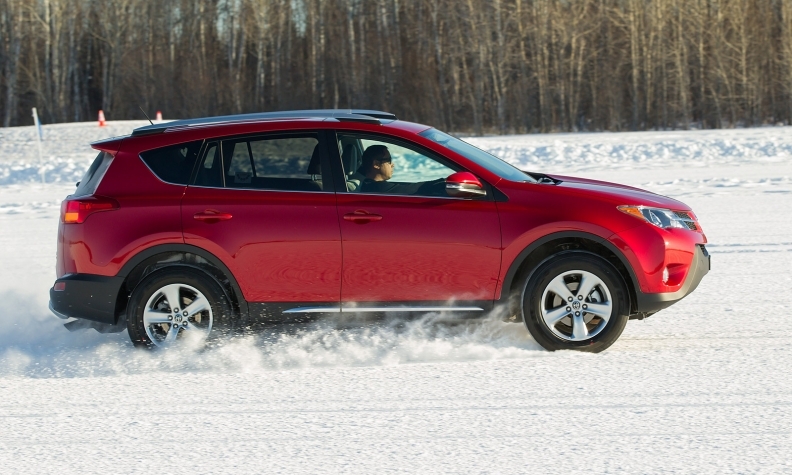 U.S. sales of Toyota's RAV4 small crossover jumped 33 percent to 21,943 units last month. Powered by strong performances in cars, minivans and trucks, Toyota Motor Corp. pulled off a rare feat in February: It outsold the perennial No. 2 in the U.S. market, Ford Motor Co.
Toyota’s three U.S. brands sold 180,467 light vehicles, up 13 percent and edging out Ford’s total of 179,673. Driving the gains were the RAV4 small crossover, whose sales jumped 33 percent to 21,943 units, the midsize 4Runner SUV, which saw an increase of 38 percent to 6,420, and Lexus’ two crossovers. The automaker also suggested it is looking to accelerate the pace of sales this month, when it will launch a national marketing blitz to open the spring selling season. Fay said the Toyota Division would offer low interest rates and favorable lease deals, but provided no specifics on its campaign. He added that the Toyota Division has about a 50-day supply of vehicles, including vehicles held in ports, to ensure dealers have enough inventory to carry them through the March event. “We are in a good position going into the campaign,” he said. Toyota estimated that total February sales came in at 1.26 million light vehicles industrywide, which would be a gain of 5.3 percent for the month. Last month the Toyota brand was paced by the RAV4, Corolla, Camry, Avalon, Sienna and Tacoma, which all posted double-digit sales gains. Among the Toyota brand’s car models, only the Prius recorded a decline. Overall, Toyota brand truck sales climbed 17 percent while Toyota Division car sales, including Scion, increased 7.9 percent. Scion by itself was down 15 percent to 3,864 units. Lexus, meanwhile, benefited from the addition of its own small crossover, the new NX. The luxury brand sold 22,995 cars and trucks, a rise of 22 percent. The total included 2,666 NXs. Sales of the RX, Lexus’ best-seller, totaled 6,490, up 14 percent. “The NX continues to exceed our targets,” Jeff Bracken, Lexus brand general manager, said in a conference call. He declined to name specific sales targets but added that a large portion of NX buyers are new to the Lexus brand and are younger than typical Lexus customers. “To attract folks who are new to the brand -- that’s the win for us,” he said. He said some conquests are coming from German luxury brands, but most are coming from other Japanese makes.